CHICAGO (CNS) — Catholic Extension has announced eight finalists for its Lumen Christi Award, which recognizes Catholic leaders “for bringing the light of Christ” to poor communities across the United States. Four of the finalists for the 2017-2018 award are Mexican missionary sisters serving in Texas; a Franciscan priest ministering on a Native American reservation in Arizona, a lay couple shepherding a remote mining community in Utah and an Army chaplain bringing healing to wounded soldiers. The other four are a young woman religious reaching out to young Middle Eastern Christians; religious sisters offering charity and mercy in a poor African-American community in the Mississippi Delta; the principal of a small mission school in New Mexico; and the son of a migrant worker who now is the pastor of a migrant-worker parish in California. The award is the highest honor bestowed by the Chicago-based organization, the leading national supporter of missionary work in poor and remote parts of the United States. The Latin phrase “Lumen Christi,” taken from the Easter Vigil, means “Light of Christ.” Since 1978, the award has honored individuals or groups who demonstrate how the power of faith can transform lives and communities. — The Missionary Carmelites of St. Teresa in the Diocese of Beaumont, Texas, have been ministering to Latinos in three parishes in southeast Texas for the past 12 years. The four Mexican sisters develop lay leaders, hold retreats, provide religious education and reach out to the rapidly growing Hispanic Catholic population. — Franciscan Father Ponchie Vasquez in the Diocese of Tucson, Arizona, is pastor of the San Solano Missions with the Tohono O’odham Nation at the U.S.-Mexico border west of Tucson. Living on a vast stretch of desert the size of Connecticut, the Tohono O’odham, or “desert people,” come together in 40 churches served by the missions. — Sister Therese Maria Touma, based in Dartmouth, Massachusetts, serves young Maronite Catholics in youth and young adult ministry. She belongs to the Servants of Christ the Light, a new religious order, in the Eparchy of St. Maron of Brooklyn, New York. 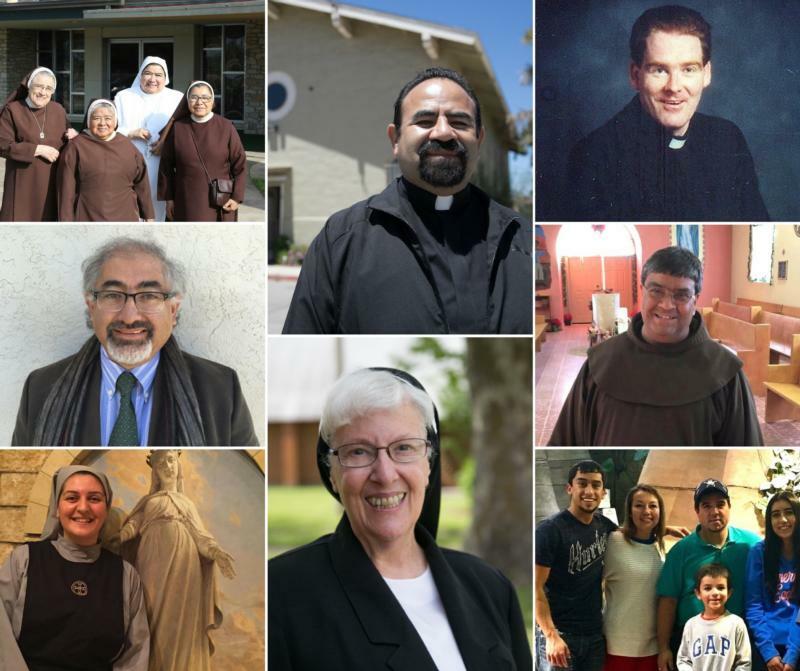 — Ruben and Rosario Cano and the Hispanic Lay Ecclesial Ministers of Utah, in the statewide Diocese of Salt Lake City, have been serving the rapidly growing Latino Catholic communities that make up 70 percent of the state’s Catholics. The Canos are lay pastoral ministers at San Rafael Mission Church in the remote mining community of Huntington, Utah. They lead religious education and community outreach at their church and travel throughout Utah. — Father John O’Grady is serving with the U.S. Archdiocese for the Military Services as an Army chaplain at Walter Reed Medical Center in Maryland, where he provides pastoral ministry to active duty military and their families. He accompanies those in need of pastoral care and has brought the gift of healing to the spiritually, physically and mentally wounded. — The St. Gabriel of Mercy Center in Mound Bayou in the Mississippi Delta, the poorest region in the poorest state, is led by the Franciscan Sisters of Christian Charity. The center is in the Diocese of Jackson. The sisters partner with local organizations to provide services such as the St. Gabriel Closet, parenting and GED classes, a computer learning lab, senior services and summer youth programs. — Antonio Trujillo in the Diocese of Gallup, New Mexico, has revitalized the small St. Joseph Mission School in San Fidel, New Mexico, which serves mostly Native American students. Trujillo saved the school from the brink of closure. By refocusing “on its true mission to be a beacon of hope and faith,” he hired teachers dedicated to the mission and increased enrollment. — Father Enrique Herrera in the Diocese of Monterey, California, is the son of a migrant farmworker who traveled regularly from Mexico to work in California’s Salinas Valley. Today, Father Herrera is the pastor at Holy Trinity Church in Greenfield in Salinas Valley, a parish comprised mainly of immigrants, many from Oaxaca, Mexico. Father Herrera gives special attention to guiding young people not only through faith formation but also through soccer and basketball leagues. The Lumen Christi winner will be announced later in the year.